Ever since the first Mario Kart game came out on the Nintendo Game System in 1992, we dreamed of having our own Real Mario Kart to race around the neighborhood on. Finally! That dream is a reality – well, if you weigh less than 70lbs that is. Just imagine how adorable it will be to have your little one rockin the road like Mario. This 6V will have them crushing the competition on their very own Rainbow Road or Moo Moo Meadows. Okay – so they won’t be able to zoom around quite as fast as our beloved Mario – but seriously, does a 4 year old really need to be hauling it that fast? Your flower beds will appreciate the fact that you can probably jog and catch up to the real Mario Kart and save them from that race car that your child imagined just hit a banana peel and spun out of control! This single seat, 6V Mario Kart Ride On toy is unfortunately only available for toddlers, but oh how cool they will look cruising the neighborhood sidewalks in Mario style. The real Mario Kart will go in both forward and reverse at a top speed of 2.5 miles per hour, and has a brake pedal so they can hopefully not run over the neighbors cat or those pesky Koopa shells. The real Mario Kart also has a seat belt for the added safety of keeping your little “Mario” or “Princess Peach” securely in the seat while they zip on down the sidewalk. To really go for the whole Super Mario look, you can make the most awesome Halloween Costume have the most awesome accessory! Just imagine how many costume contests they could win dressed up in their favorite Super Mario character costume and having the real Mario Kart to use for transportation?! OMG! 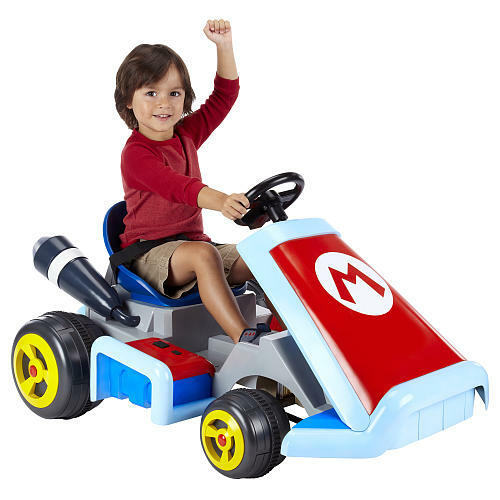 No matter how your little one dresses they will be the envy of all the other kids on the block when they jet around on the Mario Kart 6V ride on, and you just can’t get more epic than Mario. As of this posting Toys R Us is offering pre-order sales for the Mario Kart, and it is listed on Amazon.com but for $100 more than Toys R Us is advertising it for. If we find a better deal someplace else we’ll be sure to add the link. If you’re like me and needed a refresher on the whole Mario Kart gaming sensation, here are a sampling of the most popular Mario Kart video games from the current Wii version to those popular over past 20+ years. How bout a race down memory lane?